Soft colors, casual fabrics, wicker, and lots of plants: these are all popular summer themes in interior design. Whether your house is modern or traditional, you can still add a little bit of summer to your rooms. The long, sunny days and abundant green for the summer landscape can be reflected with color, texture, and portable accessories for a fresh, summer décor. The colors of summer reflect the soft blue sky, verdant green lawns, and sun-filled days. Whites, from ecru to designer white, are the ultimate summer colors. Blues, from robin's egg to navy, are also common in a summer palette as are yellows, greens, and pastels. Refresh a room for summer by painting it a bright white. Or create bright summer window treatments in provencal yellow, lavender, or sienna. Summer textures include wicker, a perennial favorite, rustic log-style furnishings, and colorful painted furniture. Stenciling is another easy way to add color and a touch of whimsy to your décor. One of the most popular recent design themes is the advent of the garden room. These cheerful hideaways are an ideal way to bring summer inside for year-round enjoyment. Common elements of a garden room include lots of plants - either real or good artificial ones - as well as wicker or other casual furnishings and antique or antique-like accessories, such as tin watering cans, terra cotta pots, and "country cottage" signs, lamps, mirrors, and other accessory items. Wicker became popular in the 1930s as an affordable alternative to the heavy wooden pieces of the early 20th century. 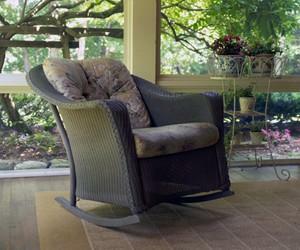 Later, wicker furniture became a favorite of 1950s porches and patios. Today, wicker can be found throughout the house and is an easy - although no longer inexpensive - way to add a summer feel to your rooms. Good, early 20th century wicker pieces can still be found at antique or estate sales or opt for new pieces and use vintage-style fabrics for a 1930s ambiance. Wicker can be easily painted to adapt to any color scheme. Stenciled and painted furniture are also useful in creating a summer theme. Old furniture found at second-hand shops and yard sales can be given a new life with a fresh coat of white paint. Talented home decorators can individualize these pieces with hand-painted flowers, leaves, and other summer designs. Those of us without such skills can find stenciling kits at fabric and home improvement stores. As with any design motif, it's the accessories that individualize a room and give it life. For summer themes, consider nautical items, such as beach signs, antique fishing gear, and lighthouse-themed items. Plants and cut flowers add a summer feel to any room, as do tropical and Hawaiian-themed items, such as tikis, flowered print pillows, and rattan window treatments.